Study mathematics and earn one of the most versatile degrees! Slippery Rock University's Mathematics major provides a strong math foundation, from calculus to abstract algebra, while enabling you to tailor your education to your interests and career goals with 15 different concentrations. While earning a Bachelor of Science degree, students enjoy a strong sense of community through clubs, activities, and dynamic study spaces. You'll also have opportunities to work closely with our dedicated faculty, who are committed to excellence in teaching and get to know you as an individual. Mathematics is more than just number crunching. A degree in math shows that you have the ability to think critically and conveys an intellectual maturity sought by many employers. The Bachelor of Science in Mathematics demonstrates you've learned how to solve complex problems, indicates flexibility and creativity in reasoning, and shows you are capable of handling abstractions. Mathematics majors at Slippery Rock also have the chance to travel to events such as the Mathematical Association of America and the American Mathematical Society conferences. Through core coursework in the SRU Mathematics program, you'll study calculus, discrete math, proofs sequence, linear and abstract algebra, differential equations, statistics, real analysis, and more. Students in the SRU Mathematics program have an abundance of internship opportunities. In the past, people have interned at John Hopkins, AETNA, and Progressive, just to name a few. SRU also features organizations such as Math Club, Actuarial Club, Kappa Mu Epsilon, and more! Learn More About Our Mathematics Degree! Slippery Rock University's Mathematics major is perfect for students looking to earn a versatile bachelor's degree, further their education, and work in a wide range of careers. Interested in learning more? Request more information today! 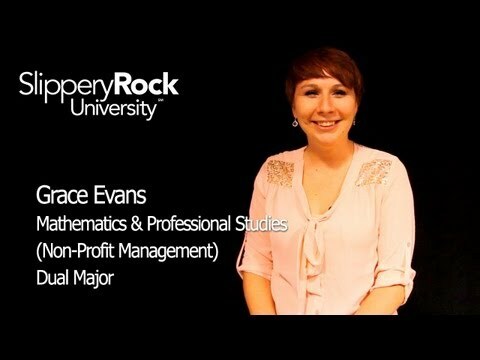 Grace Evans, a Senior Dual Major in Mathematics and Professional Studies, talks about why SRU was her first choice. Grace also talks about getting involved with many organizations on campus and how her involvement in the Green and White Society and volunteer opportunities have prepared her for a future in her field. Because of her experiences, she has learned how to act professionally outside of her comfort zone. She has traveled to Jamaica with SRU's Care Breaks. Before she came to SRU, she didn't know what she wanted to do, but after four years, she now has a clear idea of who she will become.